There are many beautiful views in Cornwall of beaches, coves and harbours, but the one from the clubhouse of The Point golf course at Polzeath is stunning. Looking across the greens, enjoying a coffee after a few holes of golf, I pondered how best to capture this view. 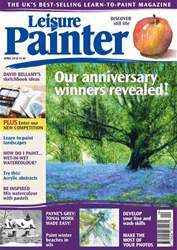 Following my painting project in the February and March issues of Leisure Painter, I now want to show you how Pan Pastels can work in a mixed-media painting. The sparkling sea, swathes of grassed headland and the manicured fairways are perfect for watercolour. The mass of trees and shrubbery lend themselves happily to Pan Pastels, while the leafless trees fall easily into the pen and ink category. I could hardly wait to begin.